When Charles's wife of 60 years, Maisie, died, he was lost. Untethered from his soul mate, his children, Ian and Janet, were worried he would shut himself away in the family home in Bentleigh and withdraw from the world. They wanted him close to them. He had lost the love of his life, but they didn’t want him to lose his love for life. Then, Janet heard an ad on the radio, “and call it what you want but I thought it was a message from mum”. Weary Dunlop retirement village in Wheelers Hill, just a few minutes’ drive from Janet and Ian’s homes, was holding an open day. “I felt this tremendous urge to come and have a look,” Janet says. “And from the get-go of walking in the ambiance, the brightness, the flowers, the staff - it was beautiful. The serviced one-bedroom apartment that was on display that day is now Charles’s home, a framed wedding photo of he and Maisie above his bed and the chimes of an old clock she loved to wake up to every morning resonating around the room every 15 minutes. In his living room the smiling faces of children, grandchildren and a great-grandchild look out through photo frames. They all visit often. Charles, a self-described homebody, enjoys watching sport on TV in the village centre, going for walks around the gardens, visiting the shops in the village van, and attends the village’s Triple-A exercise classes every Wednesday and Friday. Knowing that her father has daily support with meals and housekeeping, and help is only ever the press of a call button away, gives she and Ian great peace of mind. After the pain of losing his wife, she sees her dad beginning to thrive again. “I believe this place gives elderly people an opportunity to blossom again at a time in their lives when I think a lot of them think ‘oh, well, we’re old now, and this is it’. 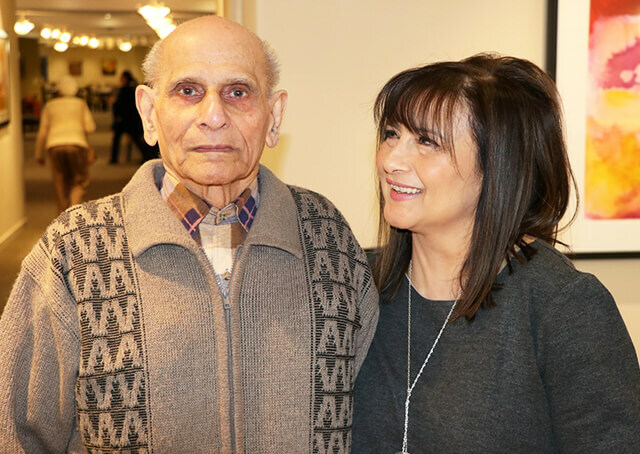 No, it’s not the case – you’re living again - and dad’s a prime example because, at 91, I’m so proud of him that he’s picked himself up and said, ‘right, I’ve got to do this’. Almost 35 years after Ryman Healthcare was founded on the principle that care has to be “good enough for mum”, Janet says that still rings true for dads, too.